The 1963 split window Corvette Stingray is one of the most iconic American cars of the 60's. Bill Mitchell, in charge of General Motors design from 1958-77, designed it. The split rear window was extremely controversial and many within GM, notably Zora Arkus-Duntov, the "father" of the Corvette, were adamantly opposed to this styling feature. The window actually made it difficult to back the car up or see motorcycle cops and it was dropped the following year. The new Stingray had independent suspension front and rear, and was powered by a choice of four different 327 cubic inch, cast iron V-8s. Two of the available engines had hydraulic valve lifters, and the other two solid lifters. The top of the line motor featured fuel injection and put out 360 hp and 352lb ft of torque. It also came at a $430.00 price premium. The transmission options were 3 and 4 speed manuals and a Powerglide automatic. The coupe version came out first and the convertible later; indeed purists within Chevrolet didn't want to make the convertible at all, but by the end of the year sales were split 50/50 between coupe and convertible. Only one in eight new Stingrays had the auto transmission, and one in six had power steering and power brakes. 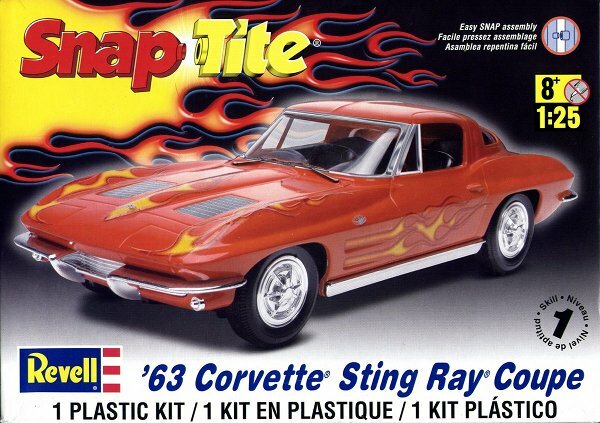 I was four years old when the Stingray came out, and some family friends had a convertible. My brother and I thought it was about the coolest car we had ever seen. I grew up in Massachusetts and exotic cars, like Aston Martins, Jaguars and Ferraris were few and far between. That Stingray was one of the first cars I ever wanted to own one day. The Stingray was rare, it was loud, it was fast, and it was special. The interior tub is somewhat simplified. The sidewalls are separate and their detail, and that of the instrument panel, is very good indeed. The chromed pieces include the shifter, wheel covers and both bumpers and the chrome is well done. The body is well executed, accurate in proportion and shape and includes well rendered Corvette script on the upper rear fender. The prominent "spine" between the split windows is faithfully captured. My sole complaint about the body is that the windshield wiper blades are integrally molded, but the same comment applies to many kits from that era. Not a deal breaker, just annoying. You can build the model in 8 easy steps following Revell's well illustrated instructions. The sticker sheet includes flames for the hood and flanks, grilles for the hood, a California license plate, Corvette script for the upper rear fender, and racing flags to apply to the hood, gas cap and flanks. This is nice kit. I didn't check the kit against published dimensions but I have seen the 1:1 car and this kit certainly captures the sleek looks rather nicely. I like this kit and I recommend it. And please don't be fooled by its Snap Tite nature. Not only can you build an accurate model from the box, but this model won the Ted Holowchuk Award for Best Finish at the IPMS/Seattle spring show in 2013. I can't think of a better testimonial than that! There is a Detail Master photo-etch set available, albeit for the standard kit. I picked up a set of Shabo whitewall dry transfers and a set of Replicas & Miniatures Company of Maryland showroom stock seat belt photo-etched belts for my own kit. But you don't need anything from the aftermarket to build this kit. You can build it in an hour with your kid, or take your time and build a contest winner. I would like to thank Revell for providing the review sample.